How far would you go for Crazy Acres Mango Jam? Meet ‘Caretaker Jack’, a self-confessed Crazy Acres mango jam addict who travels two hours just to get his fix of jam! ‘Caretaker Jack’ lives in a remote out-station in the heart of the MacDonnell Ranges in Central Australia, a long way from the Crazy Acres Mango Farm and Café in Berry Springs, the Northern Territory’s Top End. Caretaker Jack is prepared to go the distance to ensure he has a regular supply of mango jam. Karen at Crazy Acres posts the special parcel of jam to ‘Caretaker Jack’. The Jam travels across the Northern Territory, where it arrives at the Alice Springs Mail Centre. From there, the jam makes a trip on the contract mail plane which services stations in the MacDonnell Ranges region. Jack drives two hours from his remote out-station to a local cattle station, where he picks up his “much anticipated parcel”. Now that’s quite a journey – for ‘Caretaker Jack’ and the Jam! With a real love for homemade produce and jams, ‘Caretaker Jack’ first came across Crazy Acres while searching online. He was polishing off the regular sized jams quicker than he could order them. Crazy Acres to the rescue! 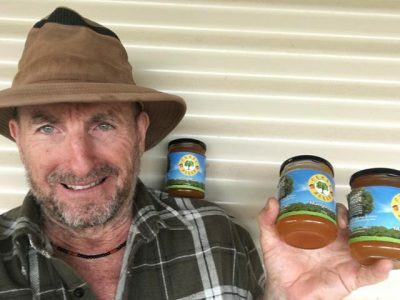 With ‘Caretaker Jack’s’ request to up the quantity we could send him, Crazy Acres custom made a 2.5kg tub of mango jam. Yep, that’s 2.5kg, a big increase from our regular 240g jars. ‘Caretaker Jack’ spreads the mango jam thick on his wholemeal toast, and occasionally a scone. “It’s the only sweet food I eat all day,” he said. Yes we can organise delivery via Australia Post for all Homemade Preserves and Dried Mango any-where! Visit our Products page to see our range or Order Online now!